When I was in my first year or two of blogging, I would marvel at the bloggers who were hitting five years plus. But now I know how fast the time goes by. In celebration of my 5th year, I’ve compiled a list of some of the best Canadian books I’ve read and reviewed on Consumed by Ink. You can follow links to my thoughts on each book by clicking on the title. This is, by no means, a definitive list. On another day, the list might have been different. To help narrow down my choices, I’ve included no more than one book per author. I’m sad for the books that are not on this list because I haven’t read them yet… I will just have to make a second list in another 5 years! Congratulations! It’s a great achievement, and I really like the way you’ve chosen to commemorate it with a must-read list of CanadianLit. 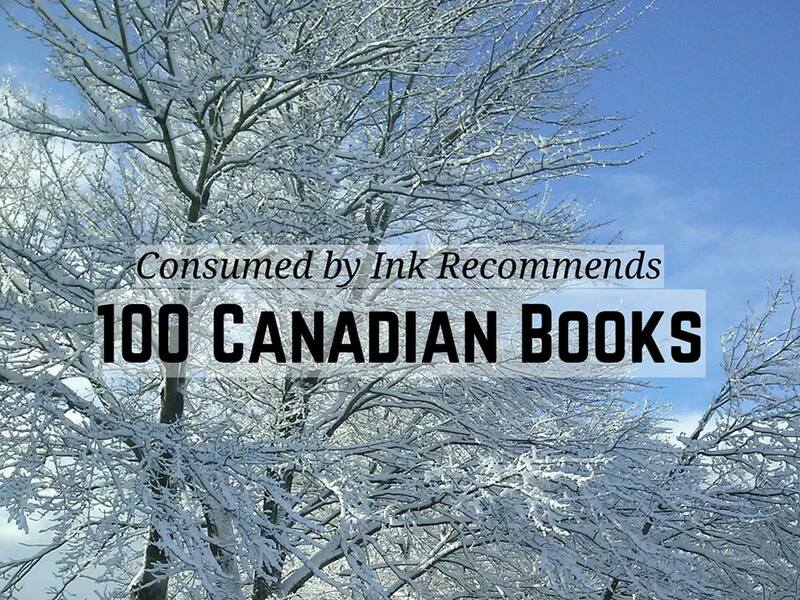 I wish I could say that I’ve read more than the three from your list, but I have read 60+ books from Canada and I’m pleased to have here your recommendations for the best to chase up and read in future. All the best for the next five years and more! 60+ is nothing to sneeze at, and far more than I can say I’ve read from Australia! Congratulations, Naomi! What a great way to celebrate. I always look forward to reading your posts and I’m looking forward to seeing you in person soon. I’m looking forward to seeing you, too. It’s been too long! I hope the weather cooperates – it’s been unpredictable these days. Congratulations on your anniversary! That’s quite a list! Congratulations on 5 years! And I have to say, when I think of Canadian books I think of you! I love finding other people who love Canadian reads as much as I do – though I’m definitely nowhere near where you are. lol. Here’s to another 5 years and many more Canadian reads! Thanks, Kristilyn! I’m excited for whatever’s coming next! I wish more Canadian books were available in the U.S. Canada has so many wonderful writers we never see in the lower 48. I’m happy to see Carol Bruneau on your list, though. She is one writer I do follow! I’m so happy to hear you follow Carol Bruneau! But, yes, some CanLit is hard to come across in other countries. Some of it is even hard to come across in this one! Congratulations, Naomi, and thanks for introducing me to so many great Canadian authors. There are several titles on your list I’ve read because of you. Thank you, Susan! It’s been wonderful to have your ‘company’ over the last couple of years! It’s a pleasure. Yours is one of my favourite blogs. Happy Five Years! (And I’m even somewhat timely in commenting :-D) I have no idea how you only got one Atwood on here though, that’s a feat in and of itself. I limited myself to one book per author to help narrow down my choices. There are a few authors on the list I could have included more than one of their books! Congratulations! So many great titles…bookmarking for future reference! Great list and happy five years! So much good Canadian fiction! Happy birthday and congrats on that amazing list. What an achievement. And I’ll second the assessment, what a great resource your reviews are. Thanks, Alexandra! It’s been a lot of fun! Congratulations on five years of blogging! And thanks for making the list. (I do love a list.) I’ve only read 10, so that gives me plenty to be getting on with. Thanks, Debbie! Moore and Raddall are both so good, you can’t go wrong with any of their books! P.S. I didn’t realize that Sharon Bala has an Atlantic Canadian connection. I thought she lived in Saskatchewan. Heard her at Read by the Sea, one year. I think she lives in Newfoundland! Oops – Sharon Butala. Blame it on (my) old age. They’re names are so close! Congratulations. Interesting list. I read a lot of CanLit and I’ve read only 11 of these! Thanks, Debra! There is so much out there to discover, isn’t there?! And thanks for dropping by. I have recently discovered your blog, which looks like one I’d like to spend more time perusing! I’ve read only four of these but now I have a wonderful resource for future reading. Great idea to do this. Oh yes, I remember that you read The Lonely Postman and, of course, Do Not Say We Have Nothing! Wait, you read and reviewed all of these books? That must mean you’re almost exclusively reading Canadian works! I didn’t realize your blog was that focused on one aspect of reading. How cool! Happy 5th birthday, Naomi. I started in June of 2013, which means we must have met each other right when you started blogging. We’re, like, from the same litter, lol. Happy blogiversary! Thank you so much for posting this – what a terrific resource for future reading! Congratulations on five years! Thank you for this list and for reviewing these books. I’ve read so few of them, but I’ll try to do better. Congratulations Naomi! Happy 5th Blogiversary! Wonderful list! I knew that Margaret ‘Alias Grace’ would be there 🙂 I am so happy to see Denis Theriault’s ‘The Peculiar Life of a Lonely Postman’ on your list! It is one of my favourite books! Why isn’t Beth Powning’s ‘The Sea Captain’s Wife’ there on your list? 🙂 I thought you loved that too. Thanks so much for sharing this list. I am saving this and will take its help to explore Canadian literature. I remember you mentioning ‘The Sea Captain’s Life’ in one of your recommended lists 🙂 I added it to my TBR after that. Hoping to read it one of these days. This is a great list, Naomi. I’ve read 17 (mainly the Giller nominees / winners) but there’s loads more on here I’d love to read. Thanks for being such a devoted CanLit champion. It helps people like me navigate our way around bookshops, hunting out the good stuff you recommend to broaden our reading palette. Oh, and congratulations! It feels like you’ve been around a lot longer than 5 years! Thanks for the kind words, Kim! I feel the same way about your bounty of Australian book reviews. And 17 – that’s awesome! This is an amazing list. And I’ve actually read some of these! I’m pretty sure you are a huge reason why I’ve been more open-minded about actually reading CanLit, so thank you. I always love reading your insightful, brilliant reviews. The Blythes Are Quoted is your favourite Montgomery! I find that such a surprising choice! I’m going to click on that link now to find out why. Thanks, Eva! You must be coming up to 5 years now too, unless you’ve already passed it! The Blythes are Quoted is not necessarily my favourite LMM, but I chose it for this list because it’s one that might not be as familiar to readers as her others. Wow, what an accomplishment! I can’t believe how many books you were able to gather for this list. Congrats on 5 years of blogging! Thanks, Katie! In the end, I was surprised by how many I wanted to include beyond the 100! A huge congrats on 5 yrs of blogging – well done. I’ve loved your Canadian perspective – so many of us keen to seek out good literature from countries outside of the US/UK publishing block and you’ve made that job a little easier for us. Sadly, I’ve only read 3 of the books on your list, although not from want of trying….I’ve been trying to source The Blythes are Quoted to finish of my Anne journey, to no avail. Oh no… it’s too bad you haven’t been able to get a copy of The Blythes are Quoted. Being Montgomery, I wouldn’t have thought it would be difficult. Wow great list! You are an inspiring blogger & reader to many across Canada. Thanks for your thoughtful reviews. I enjoy them. Congrats on 5 years. This is amazing! (I kept it in a tab to read when I could pay attention and then, somehow, the tab got closed, and I only just remembered and got around to searching for it again today – oops, I shouldn’t count on tabs to keep me organized. *snorts*) After seeing that everyone else was counting, I went back to do so as well, and we have 60 overlapping, which might seem like a lot but I actually thought it would be higher because we often like similar stories/writers. But, then, I realized just how many of the other 40 were books that I actually think of as Naomi-reads, so that when I see them on a shelf somewhere I say to myself, “right, Naomi recommended that one – I really must get to it soon”, and that’s just a lovely feeling to have! Here’s to another five years and more!